How to Make Preserved Lemons – Learn to make simple salt-preserved lemons for use in braises, sauces, tagines and recipes. All you need are lemons, a quart jar and salt! Ancient techniques of food preservation were greatly important before the days of modern refrigeration, particularly in countries with extended periods of hot weather and limited access to fresh produce. For centuries lemons have been preserved with salt, one of the simplest and most ancient preservation ingredients. Salt-preserved lemons originated in the Middle East, though they are now used in cooking all over the world. The process of storing the lemons with salt draws out their juices and causes them to soften over time, removing bitterness from the peel and giving the lemons a wider variety of culinary purposes. I love cooking with preserved lemons; they have a unique flavor that is distinctly lemon, while their pucker-inducing tartness is greatly reduced. I add them to braises, fish dishes, sauces and tagines. They brighten the flavor of many dishes. My husband, who adores lemons, eats them straight out of the jar! They pair really well with olives. I also sometimes use the salty, lemony liquid from the jar in salad dressings and sauces (the liquid is quite salty and can veer towards bitter– taste first and add with care!). 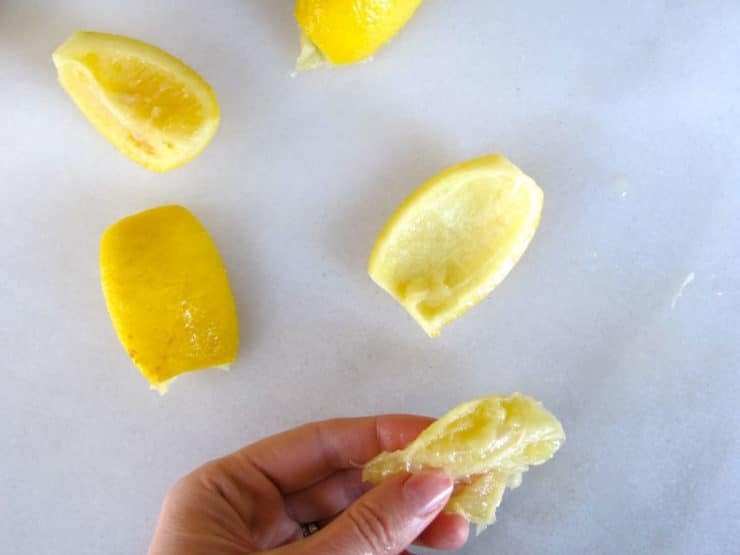 Preserved lemons are super easy to make. I always have a jar on hand, just in case I want to add a special flavor to a new dish. You can preserve the lemons sliced whole (the peel still attached in one place) or quarter them; it really doesn’t make a difference how they are sliced. I prefer quartering them because it makes handling them easier, allowing me to stuff the jar with more slices. Generally only the peels are used in cooking, as the lemon flesh soaks up a lot of salt from the preserving liquid, rendering it mushy. For a delish recipe using preserved lemons, try my Moroccan Lemon Chicken with Olives. Start by cleaning your quart jar in hot soapy water. Dry with a clean towel. Clean the outsides of the lemons, rinse and pat dry. 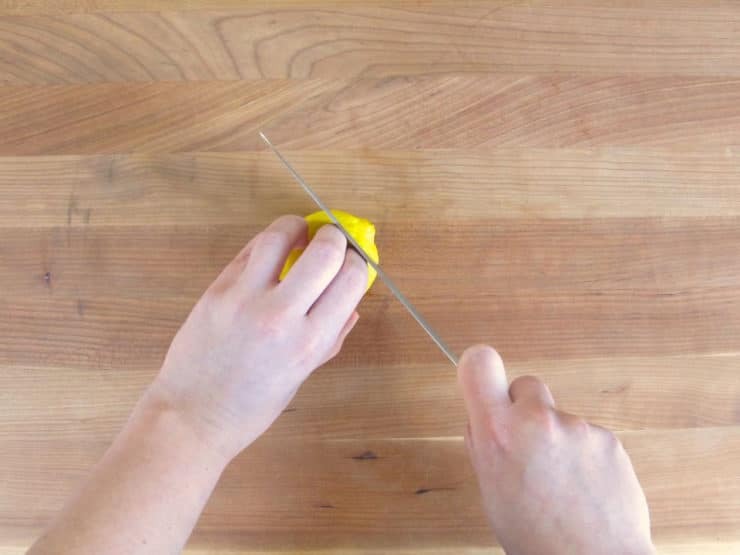 Slice the ends from the lemons to create a flat top and bottom. Stand the lemon on one of the flat ends. 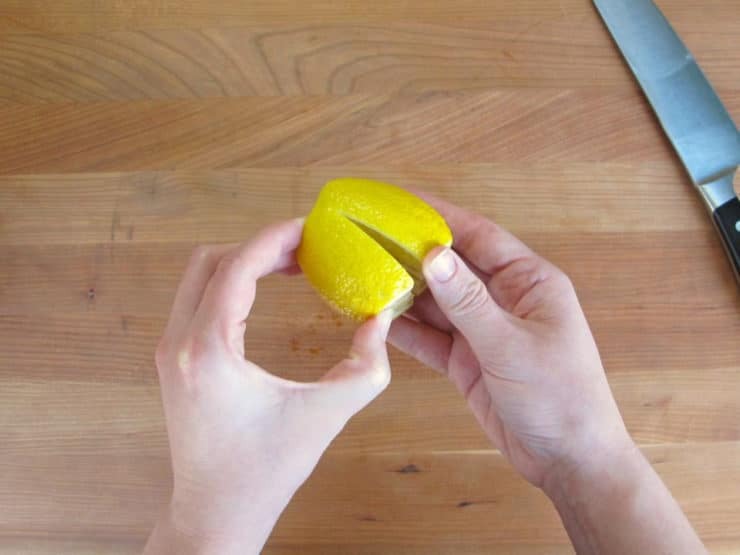 To preserve the lemons whole, cut an "x" in the lemon and stop when you are about 1/2 inch from cutting all the way through. The quarters of the lemon remain attached at the base. 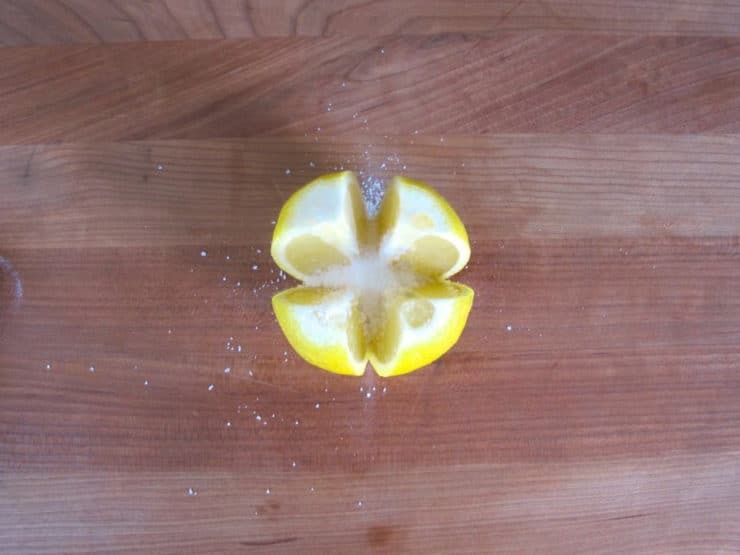 Open the lemon and pour in 1/2 tbsp of salt. Don't worry if some of the salt spills out. Once you salt the lemons, pack them into the jar as tightly as possible. You can use a pestle or a wooden spoon to push them in. Once all of the lemons are in the jar, add an additional 1 tbsp of salt. Press on the lemons one more time to extract as much juice as possible. If the lemons are submerged in juice you can secure the lid, if not you may need to add additional fresh lemon juice to top them off. 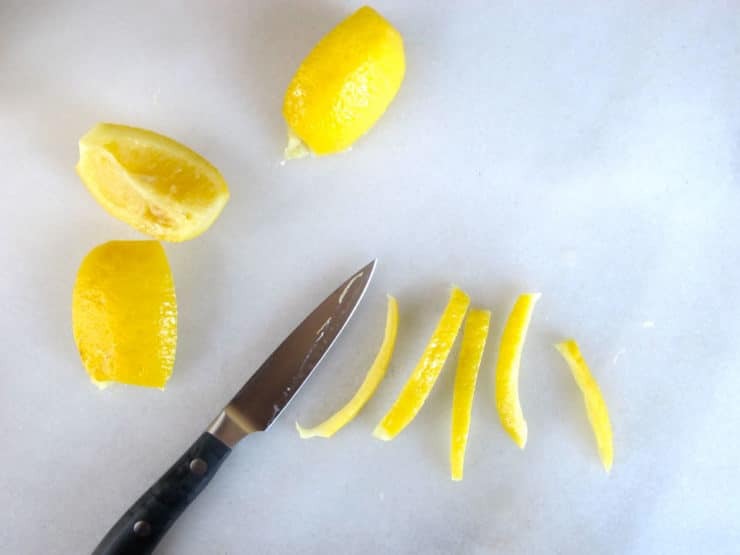 Alternatively, after slicing off the ends from the lemons, you can simply quarter them into four separate pieces; the quarters do not need to remain attached at the base. 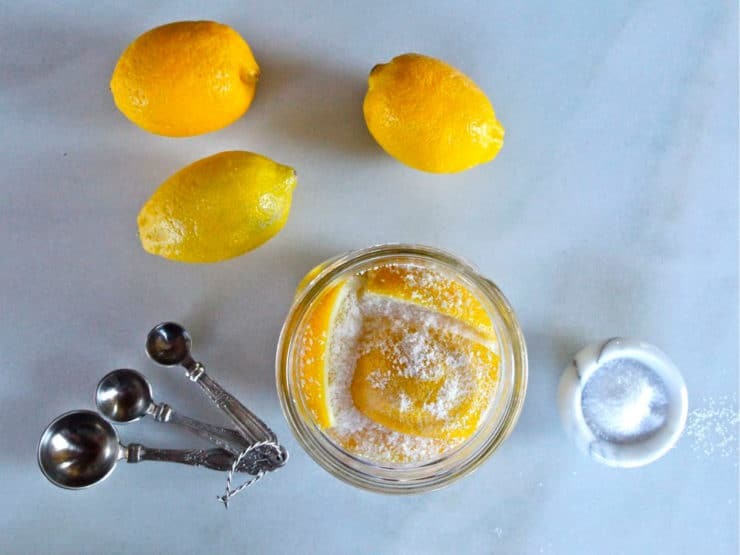 If you use this method, pour 1/2 tbsp salt into the bottom of the jar, place four lemon quarters in the jar, and sprinkle 1/2 tbsp salt evenly on top of the for slices. 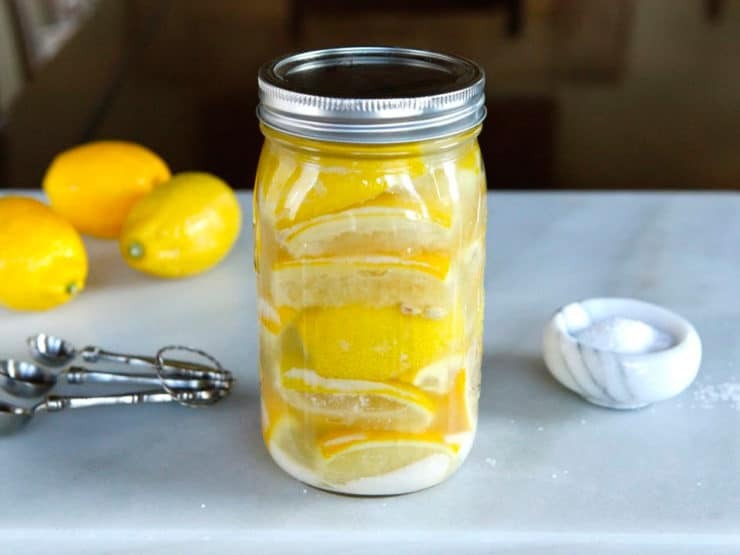 Repeat with each quartered lemon, alternating layers of 4 slices and 1/2 salt, till the jar is tightly packed with lemon slices. Sprinkle 1 tbsp on top of the final layer of slices. 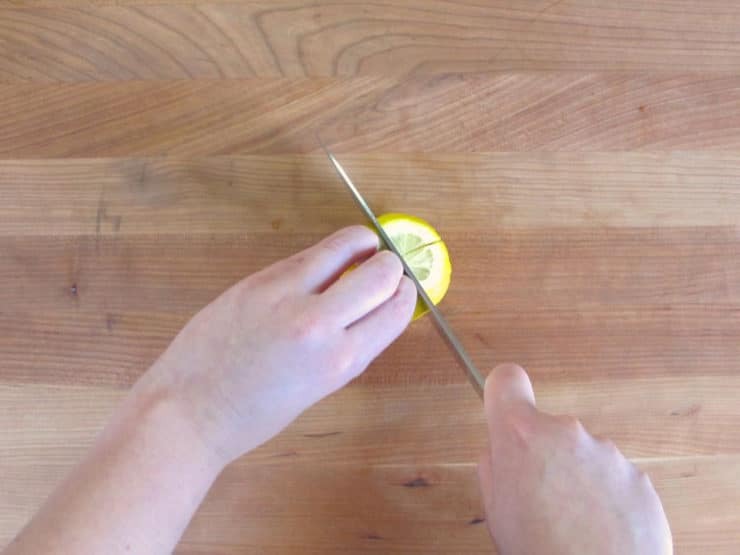 Use a pestle to press on the lemons and extract as much juice as possible. Top off the jar with fresh lemon juice if needed. 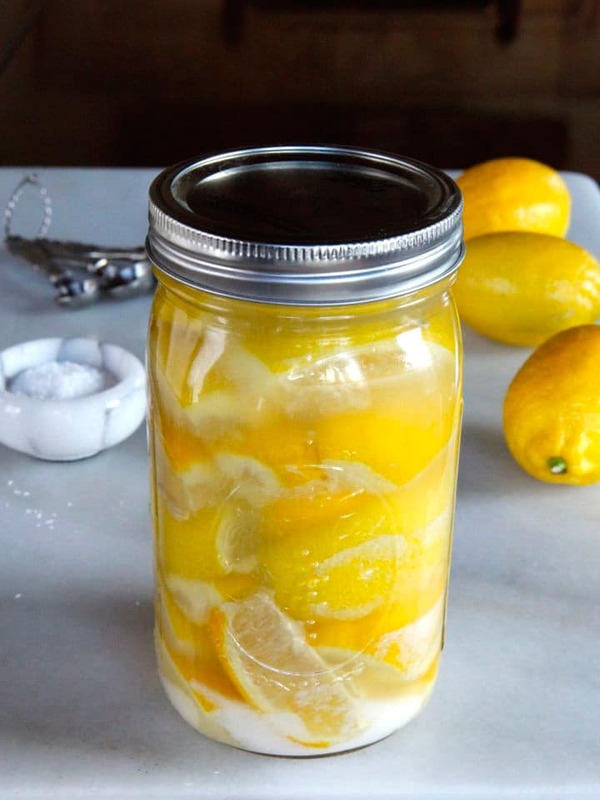 Seal the jar and store the lemons in a cool dry place for at least 1 week. Give them a shake every once in a while to disperse the juice and salt. After 1 week, move your lemons to refrigerator. When the peels become translucent, you will know they are soft and ready for use. 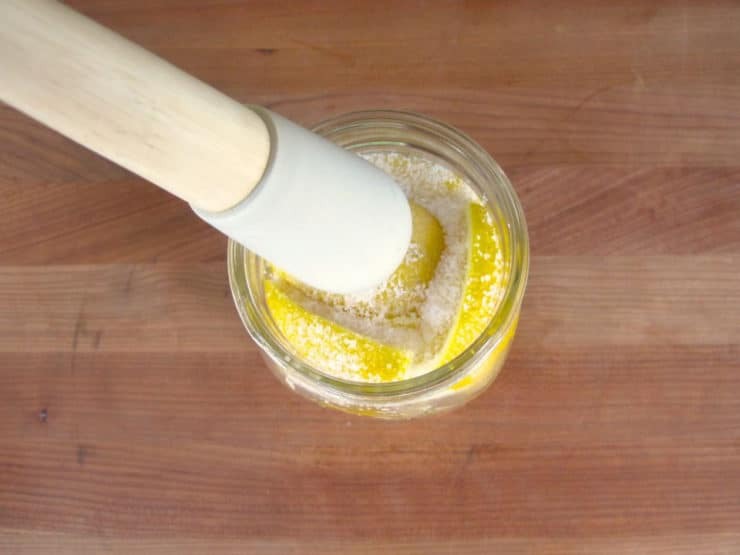 When you are ready to use a lemon, remove it from the jar and rinse to remove excess salt. Cut all of the remaining lemon flesh and pith away from the rind and discard. You can store the lemons in the refrigerator for up to 6 months. Tori, I squeeze the juice of half a lemon everyday into my first-thing-in-the-morning glass of water. So I accumulate lots of lemon halves with little lemon juice left in them. If I crammed, many of these ‘spent’ lemons tightly into a jar, added your recommended amount of salt, and filled the jar with water, would they end up as preserved and palatable as if the jar was filled with lemons with their flesh intact? It would work if you use lemon juice (not water) to “top off” the jar. Hey there. First time reviewing. So. I made these yesterday. But I ended up sealing them and jarring them (as you would a tomatoes or sauce). Will this stop the fermentation process or, should I unseal them and just keep in the jar …. thoughts? If you use a canning process the fermentation stops. My jar is only half full with lemons and juice. Is that ok? Can I top the other half off with boiled water that has been cooled? Thee lemons must be fully covered with lemon juice to properly preserve. If your jar is half full but the lemons are covered with juice, you’re fine. 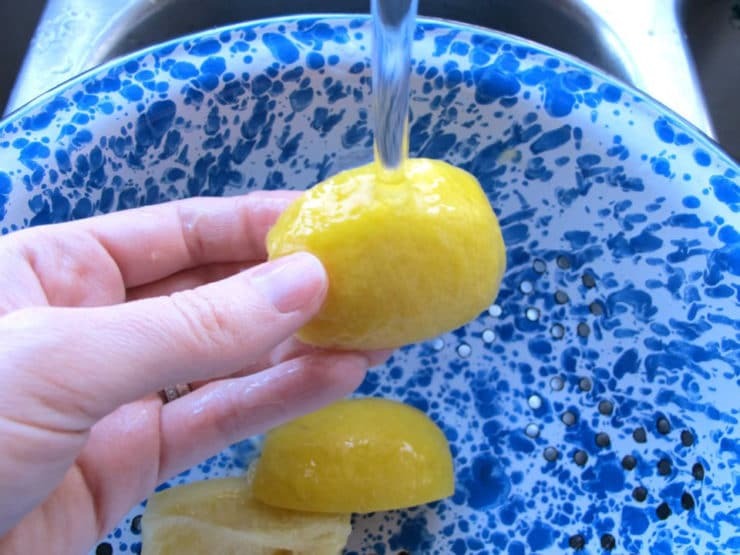 If the lemons aren’t fully submerged, you can try waiting an hour or two and mashing the lemons down, the salt will extract more juice from the lemons and may give you enough to cover them. Thank you for such an easy recipe. I will be making this tomorrow and look forward to my own preserved lemons in the future! Are those nutritional amounts for the whole jar? I am so very pleased to have found this recipe. It is easy and simple and will make some of my new recipes I want to try fun since I will actually have the correct ingredients without having to shop online to find them. Thanks so much. this recipe worked great! However, I’m curious how you store the rinds that you have extra – do you put them back into the brine? Wash them off and dry them and put them into something else? I am using them for a dish but I still have a bunch left so I’m curious? Hello, the jar I had wasn’t 100% sealed. When I turned it over a week later to disperse the salt it leaked. Is it still ok? Hi Lorraine, it should be fine if the lemons were mostly submerged in juice. If it’s been one week, move the jar to the refrigerator. The jar does not need to be “sealed”; in fact, as the lemons ferment in the salt solution, they produce CO2 and this needs to be vented. I was wondering about a lower sodium version to the recipe. Would it work? I have family members with high blood pressure. Hi Christina- you can use a combination of sugar and salt, but the flavor won’t be exactly the same. A certain amount is salt is needed for preserved lemons, they are meant to be quite salty. However, you don’t generally eat them– you use them for cooking and flavoring dishes, so only some of the salt makes it into the final dish. You can even rinse them prior to adding to recipes to remove some of the excess salt. I bought a package of 7 lemons and prepared 2 pint jars, only to realize half way through that all the quartered lemons would fit into one pint (2-cup) jar. It was difficult to tell from the pics what size the lemons you used were. I wonder if you could include the weight of them in your recipe. The 7 lemons weighed 454 g – 1 lb. I was unsure how much salt to add, once I started and realized there was a problem, so tried to remove some and now don’t know how much there is in them. Will more salt then necessary do them any harm? Hi, I was wondering what the shelf life of the lemon preserves are. For the first time ever, I made some lemon preserves on June 5, 2017 and put them in the fridge on the 15th. I forgot about them, and something just jogged my memory today. They have never been opened since I put them in the jar. I can not tell, but it looks like the salt might have corroded the lid of the jar. Are they safe to eat? Thanks! They should be fine for several months or even up to a year. However, if anything looks or smells “off” then it’s best to be safe and discard. Thanks for the preserved lemons receipe. I first learned to cook with them on a cruise ship Italian cooking class. Fabulous in a shrimp risotto dish. Hi Joe, Tori’s assistant Ashley here. The lemons should be fully submerged, so you can always add more fresh lemon juice if you find there isn’t enough liquid. If the lemons that weren’t submerged aren’t moldy they should be fine to recover. If they are moldy, I would start over. Could you substitute salt with sugar? Hi Lupin, Tori’s assistant Ashley here. It needs to be salt for this method. I’m not aware of a method for preserving lemons with sugar. 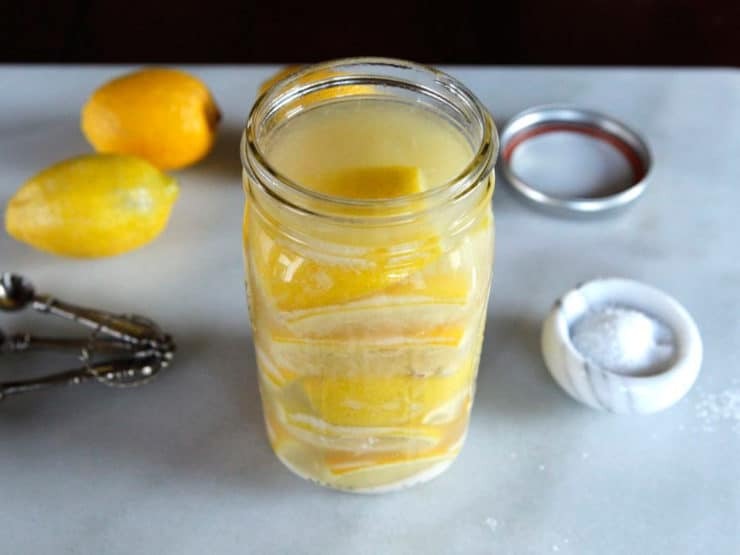 Preserving lemons in sugar is a completely different food. For Moroccan dishes you need to use Tori’s recipe. Hi I’m originlay from India, there we always use sugar and salt and some hot red pepper pwd. You don’t have to use Mason jars, just bottle with tight lid. And the older the ‘pickle’ is it gets darker. It has medicinal values.it can stay out side in the pantry for years.I also lived in France for 9 years, and I never made the salty lemons because, all I had to do was go to the farmers market and buy lemons and olives… yum. but now In the US I slice lemon into thick slices with salt, its good enough! Hi Marilyn, Tori’s assistant Ashley here. I’ve never noticed a bitterness with preserved lemons. I would not recommend adding anything extra to the jar when preserving the lemons. Hi i have just made my first ever batch last night. Im so excited i loved doing it. Iv made one jar with spoon honey in, for winter lemon tea. Hi Lesley. I’m really interested in the varieties you’ve made. How did they taste? They sound lovely. I am wondering if it would give acceptable results to cover my lemons with water rather than lemon juice. Hi, Tori’s assistant Ashley here. I would not advise using water in this recipe. I have preserved lemons (which I made) for one year. Are they safe to use? Hi Linda, Tori’s assistant Ashley here. If they were kept in the refrigerator they should be fine, as long as they don’t look or smell off. Hi – would you remove the excess salt on top of the mix before using this ? Hi Noel, Tori’s assistant Ashley here. Over time the salt breaks down into the mixture, so there won’t be any excess salt sitting on top of the lemons. When you use the lemons you can feel free to use as little or as much of liquid left in the jar as you like. It’s really a personal preference. I’m wondering if you could water bath can these? Would like to make several jars but I don’t believe we will go through them in 6 months. What do you think? Hi Kate, Tori’s assistant Ashley here. I would not recommend canning these in a water bath. Part of the process is giving them enough time to preserve naturally and introducing them to boiling water would disrupt this process. 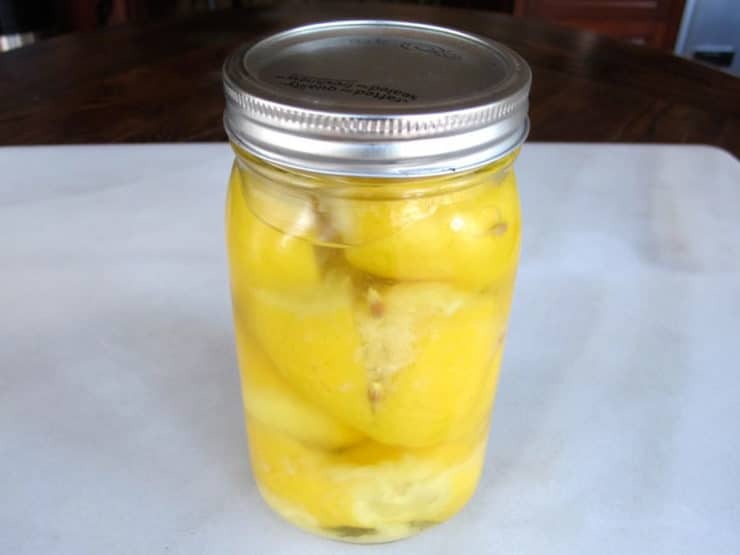 I have used lemons preserved in this manner that have been in my pantry shelf for 4 years. They taste and present as well as the ones I preserved 4 months ago. I don’t refridgerate them, and I live in humid Florida! They are packed very tightly, and stay- mold-free- on the shelf. I have also read that you can add more lemons to the same brine as you have them, thus keeping the brine going for years. By the way, they make a beautiful and interesting gift! Do lids have to be vacuum sealed? Hi Edie, Tori’s assistant Ashley here. The lids need to be tightly closed, but not vacuum sealed the way you would with canning. I’m hoping an experienced canner/preserver can weigh in with a little advice for me regarding this recipe…. I’ve made preserved lemons a time or two before and thought I had the hang of it, so I decided to make a batch for Christmas this year to give as gifts. (I even found Meyer lemons!) I followed the instructions in this recipe – sterile (new) jars, cleaned the lemons, etc and there seems to be something strange happening with my batch this time around. It almost seems as though there is pressure inside the jar. The tops (mason jar style) on a few of my jars have buckled??? I’m concerned enough with the possibility of botulism, (even with all the salt and lemon juice), that I’ve decided against using them as gifts, but I would really like to know what might be happening here and where I may have gone wrong. Or is this normal?? The lemons have probably released gases as they fermented therefore causing the buckling. Botulism maybe unlikely due to high salt content but anything is possible. I usually slice my lemons and place into a glass bowl with various spices, chilli and salt, gently pressing down on lemons to extract some juices and then pack into sterilised jars with plastic wrap and elastic band whilst fermenting. Leave them in a dark cupboard for a few weeks and then place in the fridge. Taste them you will know if they need to be out longer to ferment more. I utilise the whole slices in small quantities, you can wipe with paper towel if you wish before using. Remember to use good quality salt. I don’t think botulism can live in acidic environments. Join the group “wild fermentation uncensored” on Facebook and ask about your preserved lemon experience and concerns. There are many knowledgeable people in that group that can tell you exactly what’s going on! Mine did this also….The buckling. I noticed it happened in jars that had more than 6 lemons. Maybe the additional lemon caused more than usual gas? Did you toss them ? Beware of store bought Meyer lemons because they are often coated. Preserved lemon recipes use the rind, not the pulp of the lemon. So organic is the only way to go. The Lemoneira-brand Meyer lemons I purchased tried to conceal this information by writing in almost invisible ink of yellow on a green background, in teenie tiny font the following: Coated with Food-grade Vegetable-Beeswax, and/or Lac-Resin-Based Wax or Resin Coating to Maintain Freshness. This ridiculous oxymoron is absurd on its face. Two rounds of boiling and scrubbing did not remove the coating, which was visible as a white film on the pan and colander used. Even scrubbing did little good. In the end, I just picked some lemons off my own tree. Meyer lemons are not traditional for this recipe. The main thing is that the lemons be organic. So if you have your own tree, or access to organic Meyer lemons, lucky you! Do you have to refrigerate them are can you keep them in the pantry till your ready for them ? Hi Shirley, Tori’s assistant Ashley here! We would not suggest keeping the lemons in your pantry long term. They should be moved to the refrigerator after one week. I am coming in VERY late to this ‘party’ as the last comment year is 2014! But I live in Arizona with two VERY prolific lemon trees..(and a husband.. lol) I mean I just can’t USE them all.. I am giving them away, throwing them away.. Always looking for recipes that use a LOT of lemon juice in their ingredients list. So I am looking forward to trying this and giving as gifts, Thanks!! I make pickled lemons all the time, using Moroccan lemons when I can get them, otherwise regular lemons. After they’re pickled I grind the entire lemon quarters in my food processor and keep it in the fridge. It’s fabulous to add to any sauce, chicken or fish dish or salad dressings. If you eliminate the salt from your recipe it won’t be oversalted from the pickles. I often just mix mayonnaise and ground pickled lemon to make a salad dressing (add a tad of oil if it’s too thick) and it’s always such a big hit that people have asked me why I don’t make it to sell. When you grind the entire lemon quarters, do you 1st remove the the inside of the lemon and only grind the peel? The brine is excellent in bloody marys!! I have made 10 jars at a cost of $75.00 and now have 10 fabulous Christmas gifts! I found you by chance and am thrilled with your recipes! I’m basically a novice cook. All my life someone else cooked for me. I didn’t begin cooking until my husband’s death in 2015, and post bariatric surgery. Now there was a cook! My daughter inherited his skills, thank God. As I was saying I could cook, just had no need to but, now it became a necessity. There wasn’t a method of cooking that would sit right with me, I would fear eating because it literally caused pain. it was suggested to me to try try Mediterranean style, I believe it was a chicken dish I found. it was delicious then it was a curry dish and pickled veggies, lemons, a multitude of recipes, now I search the web for just your recipes. And now I actually look forward to cooking and truly love it. It’s no longer a necessity it’s pure joy, you make it so easy! 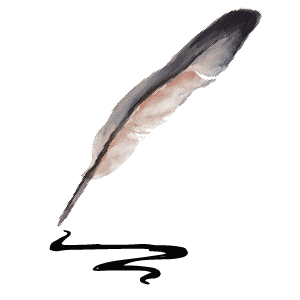 Thank you and keep blogging. I also recently learned you can freeze whole lemons and defrost in refrigerator. Yeah! Thanks for the tip to cut them through into individual quarters – I have always left them whole which makes packing the jar difficult. Do I need to store the lemons in the fridge after one week or can I keep them on the shelf and store in the fridge only after opening? Awesome idea. Can’t wait to try. I have heard a recipe calling for leaving in dark room temp for a period. Then pouring olive oil on top, and refridgerate. I also add olive oil on the top of my lemons, something I learned in Italy when we made wine, we top the wine bottles with our own olive oil. I was wondering what you meant by seal the jar. Do you mean seal by putting the jar in a water bath, or just simply twisting on the lid? Simply twist on the lid, no water bath required here. Do you have a recipe for canning zucchini and roasted peppers under oil? Not on the site, but I will keep it in mind for a future post! I have just made my first preserved lemons and one of the jars is a little bit short of lemon juice, can I open it to add more juice? Yes, most definitely you should add more lemon juice Melvene. No problem opening the jar. Enjoy! What can I do with the inside of the lemons after they have been preserved, can I eat them? Hi Cynthia, the insides of the lemons turn super salty and somewhat bitter. I’ve never found a good use for them, unfortunately, so I discard them. My husband, however, will eat them from time to time– he loves strong flavors. Personally, I find them far too salty! But if you like the flavor feel free to eat them. I always use everything. No need to throw anything away. When you use them in a recipe, simply adjust the amount of salt accordingly. In other words, when I use preserved lemons in a dish, I don’t generally add any other salt. The flavor of the flesh is amazing. Mike, I actually find the flesh somewhat bitter. I am pretty sensitive to bitter flavors though. My husband, like you, enjoys the flavor. I would not add the flesh to a recipe that specifically omits it, unless you are confident that the whole lemons will work, as it may result in a different flavor than the recipe author intended. I live in a warm country. Can I ferment the lemons in the fridge? Someone said to just cover the jar with Saran Wrap, to allow the gasses from fermentation to escape. Should I do this? Or can I seal the mason jar? Thank you so much for this wonderful recipe! Hi Sylvia, I always seal the mason jar with preserved lemons. Very little gas builds up during the process, but you can loosen the cap of the jar once a week or so to release gasses if you like. If your home is warm you can keep them in the refrigerator, but the lemons will take much longer to soften and become translucent. I would suggest keeping them in the pantry for best results– even if your home is on the warmer side, as long as you keep them in a dark, shaded area (not a window with full sun) they should be fine. Enjoy! This Lemon Pickle can be made by using used lemons ( after lemon juice have been used by you ). Keep a cleaned 400-500 grams glass jar handy in your kitchen. As and when you use fresh lemon juice in your dishes, just put the left over skins of lemon into the jar with half level teaspoon of salt. Keep putting lemon skins of at least 7-8 lemons. Always shake the jar after every top up of lemon skins. Now remember, you just put half teaspoon of salt, after every 7-8 lemon skins. Please try and keep the jar with lid tight out in the Sun, for at least 4-5 hours every day. In case you live in a cold climate country, then you can keep it at a warm place having light. Your lemon pickle should mature in 2 to 3 weeks time. This pickle can be used in any manner (with flesh or only peel) according to your recipe. I make preserved lemons with allspice, coriander and a cinnamon stick packed into the mix. You can buy preserved lemons, but nothing comes close to homemade! The tiniest bit added to soups, stews, even ice cream brightens the flavor. Hi Gransma SQ– the rinds are traditionally used in savory cooked dishes likes stews, braises and tagines. They impart a lemony flavor to slowly cooked sauces. The rinds become less bitter after they are preserved, however they are not really suitable for using in hot or cold tea because they are a bit salty (even after rinsing). Think about it this way– if you had a braised chicken dish with a sauce that you wanted to make lemony, you would add the rinds to that sauce at the beginning of cooking and let the sauce simmer with the rinds to give it a nice lemony lift. Hope that makes sense! I once gave some to a friend who did not know what to do with them, so she sliced them up and ate them as a beer food. I have done the same they are nice like that. In roast lamb gravy, with peas and in anything Moroccan. Hi Simone, either table salt or kosher salt will work. Enjoy! 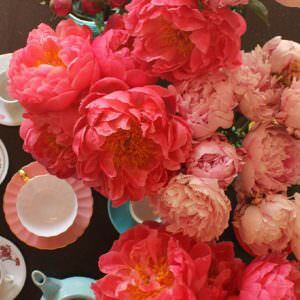 I slice them and freeze them and use the slices in iced tea. Thanks! Preserved lemons, a great gift to give to other and a great gift to keep for yourself. Yum! 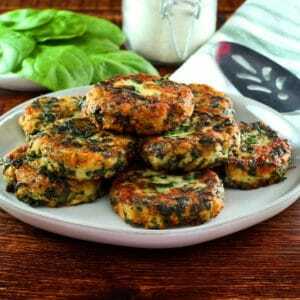 You can add cinnamon sticks, basil leaves and coliander seeds. It’s yummy!!!! This is great. I always have lemons and sometimes waste them because I have them too long. What a great idea! I can’t wait to try it. Love all your recipes! Thanks, can’t wait to try them. This is so spot on! Gotta try this! Almost uncanny (haha…pun intended.) I’ve been canning and into also beets (red velvet cake) this week! Preserved or pickled beets up next? 🙂 Yum! can the juice be used for anything or is it too salty? Right up my alley. I love canning and to have new food items to my pantry this is a plus. Meyers are best I think! My mother did this in fall so we have it in wintertime! Hi Nancy, I give the jars a good cleanse in hot soapy water, no need to boil sterilize (though you can if you prefer). The salt and acid from the lemon juice ward off bacteria growth. I’ve been using up the meyer lemons I preserved last summer from my tree. They are amazing. I made a Moroccan chicken dish with them last week that was the bomb. Can you do it with limes and oranges, too? Oranges may not be acid enough. Limes certainly work but they do not stay green. These make a great gift too. They are expensive in the shops and so easy to make. I also add a bay leaf, a couple of peppercorns and a couple of coriander seeds to each jar. About a month before they are ready and I don’t keep them in the fridge until they are opened. I forgot I also add a cinnamon stick. Do you recommend regular lemons or Meyers lemons? 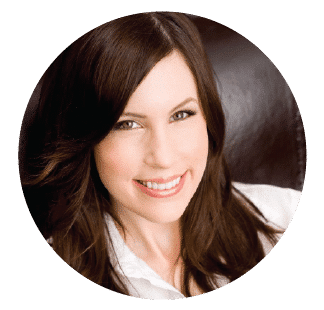 Hi Jenni, both Meyers and regular lemons work well and provide slightly different flavors. Wonderful, thank you for letting me know. I think I will try Meyers first I just love them in salad dressings. I made a Lebanese baked eggplant-thing last month and had to drive all around LA to find these. This is great!